It is of course hot and very loose slot games you will be looking to play online, however it is often the slots that boast an unusual theme that will give you the chance of winning big! 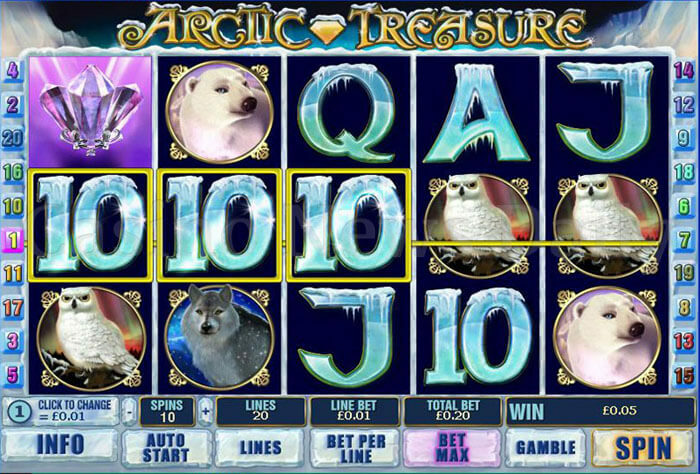 Although the Arctic Treasure slot game, as its name does imply, boasts something of a cold and blustery theme it can be a slot on which you could in some mega amounts of cash. What makes this 20 pay line slot from Playtech one worth playing it that the base game has a huge 10,000 coin jackpot on offer. However, when playing off each spin if you spin in three or more scatter symbols or get the additional bonus symbols on reels one and five you then will trigger one of two different bonus games. Being a multi stake slot you are able to play it for any stake level you want to play it for, including some very tiny amounts of cash, or if you like to high roll then you can play it for some very substantial stake amounts too! You will find the Arctic Treasure slot game offers you an auto play option settings, so whenever you get the urge to set the slot to play off each of your spins for you automatically then that is something you are going to be able to do! However, it is the bonus game you will always have your eyes set of triggering when playing this slot, for that is how you can and may just achieve the very highest valued winning payouts. So with that in mind so let us give you an insight into who that bonus game plays off! There are in fact not one but two bonus games on offer on this slot, the first is a picking game on which you have the chance of picking off locations from the bonus screen that can aware you with a bonus payout worth 150 times your base game stake amount. You will need the bonus symbols to appear on reels one and five before that bonus game is triggered. Ten free spins on x3 multipliers are also up for grabs when playing the Arctic Treasure slot game form Playtech and to be awarded with that bonus game at least three scatter symbols must spin in! In addition to those two bonus games we have motioned above whenever you play the Arctic Treasure slot and spun in a winning combination you can make use of an optional gamble game. We would urge you to avoid taking that gamble game for it could have a negative effect on your bankroll if you take it and get a losing outcome several times on the trot! One other thing to keep in mind is that the way the bonus games have been designed on this slot are such that the amounts you are wagering on the base game and the number of paylines you do have in live play will have an effect on your winning chances, once those bonus games are trigged. With that in mind do try and always play this slot with at least all of its pay lines in play and for the best winning opportunities do consider playing it for slightly higher stake amounts that you usually play online slots for. No matter what stake you do play the Arctic Treasure slot game for you will find that it is a completely random slot and one that does boast a higher than average payout percentage!